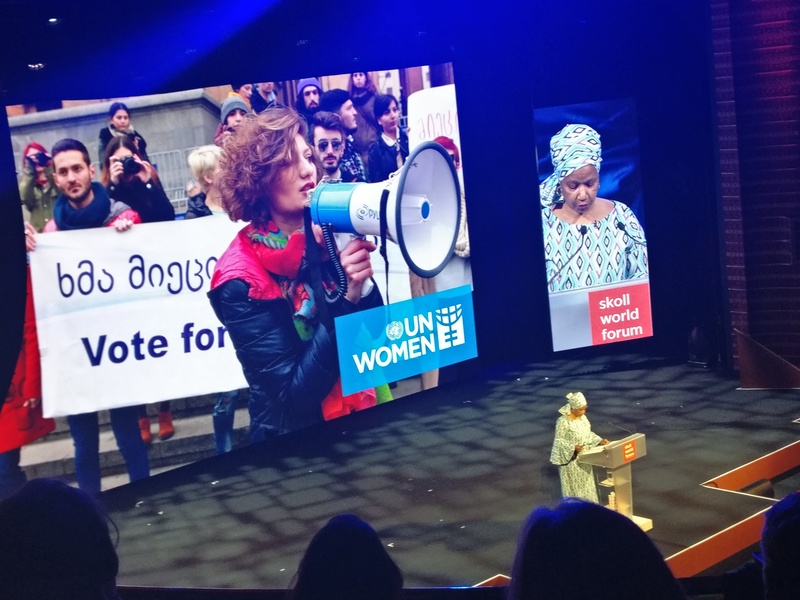 This year’s Skoll World Forum was opened by some of the world’s most famous humanitarians. Focusing on the theme of “proximity”, speakers included former US President Jimmy Carter, director of the Equal Justice Initiative Bryan Stevenson and South African politician and UN official Phumzile Mlambo-Ngcuk. With big names came even bigger statistics. Over the two-hour opening plenary, Stevenson told us that one in three black male babies in the US would end up in prison, tribal-rights attorney Tara Houska that the figure of native women who are sexually assaulted has risen to one in two and Mlambo-Ngcuk that women between 24 - 35 remain the poorest on earth in all countries. Gender power and equal pay was at the forefront of the session, and the message was simple: now is the time to act. Jimmy Carter argued that empowering the world’s women could be the key to a more peaceful world, while Mlambo-Ngcuka described unequal pay as “robbery”. She stated that it was time for women to stop “taking one for the team” when an organisation’s capital is low. Using the example of the fact that the Google search for “Women’s Rights” increased by 700% in 2018, she emphasised that now is a “tipping moment” to fight for a change to unequal pay, and urged not only the women affected but employers and policy makers to take responsibility. The topic of climate change was also on the agenda, particularly in a concluding discussion between Houska and former UN climate chief Christina Figueres. Both laid out simple steps people can take in their own lives to help the environment, with Houska urging people to simply find out where their food and water comes from. Figueres argued that the “bubble has burst” for people who claim climate change is someone else’s problem, and that every single person can make a difference by reducing their meat and gas consumption. With this year’s theme as “proximity”, there was a big focus on getting close to those you disagree with. South Africa’s Mlambo-Ngcuka recounted advice from Nelson Mandela on the power of working closely together with opposition. She said she used this advice when working as a Minister of Mines and Energy by bringing together opposing countries like Sierra Leone, Angola and DRC to tackle the ‘blood diamond’ crisis. Not all the facts this year were depressing. In fact, Jess Search’s speech was a powerful ode to the huge advancements in female equality of the past year, covering the success of the #MeToo movement to fact that women in Saudi Arabia now have the right to drive. It’s not all doom and gloom. Perhaps, we should all have a bit more of what Stevenson described as the “superpower” of hope. Watch this space for more stories from the Skoll World Forum and fringe conference Marmalade.